The site of the future Eastern Mennonite School. Can you imagine Eastern Mennonite University nestled in densely populated Fairfax County, just across the Potomac River from Washington D.C.? The earliest version of EMU was a four-week Bible institute held in January, 1915. 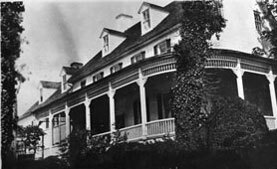 Forty-nine students, taught by five men, lived and studied in a 19-room mansion. It was old even in those days, dating to the late 1700s, but it was a built-to-last structure, originally home to George Washington’s property manager and cousin, Lund Washington. The property was six miles from Washington’s homeplace, Mount Vernon. It was being offered for purchase on favorable terms by Christian Garber, who lived in the mansion and who shared the dream of a Mennonite school. Garber offered to donate his mansion with 2½ acres of land if the board would purchase an additional 300 acres for $13,000 (in today’s dollars, that would be $268,000) to help free him from a burdensome mortgage. Hubert R. Pellman, author of Eastern Mennonite College, 1917-1967: A History (from which much of this article is drawn), noted that the Garber offer was good since the mansion alone was valued at $40,000 to $50,000. Hayfield Mansion near Washington, D.C.
he mansion, known as Hayfield, was big enough to suit all the school’s purposes classrooms, offices and dormitory rooms. The founders liked the fact that the building was on hundreds of acres of productive farmland, away from the corrupting influences of the city. But the idea got snagged on the age-old dilemma faced by folks trying to raise money for a brand-new proposition: The school’s founders could not sign a contract to buy the property without some money in hand from donors, and donors would not put up money when the viability of the school and the desirability of the site were uncertain. At least one key Mennonite felt the site was too close to the militarism of the nation’s founding fathers. One cannot help speculating; If Mennonite leaders had built what came to be known as Eastern Mennonite School (EMS) in northern Virginia, their $13,000 investment would be worth mega-millions at today’s real estate prices. In every financial crisis and there have been many for the school they could have sold a bit of land to dig out. But would the school be the same? Would it have stayed true to its mission? Brunk and others sought support from a broad base of Mennonites living in the mid-Atlantic region in Pennsylvania, Maryland, and Virginia but response was mostly tepid. Many Mennonites then viewed (and some branches of the church even now view) education with suspicion, feeling it opens the door to the negative influences of the wider world. Some potential supporters saw the Western world jumping into World War I and counseled waiting. Others thought that the war was even more reason to start a school that did not subscribe to war. EMS landed in the Shenandoah Valley of Virginia in 1917 for this reason: Mennonites at Weavers Church in Rockingham County proposed that the school be set up at 23-acre Assembly Park near Harrisonburg. Key leaders at Weavers offered to provide seed money and other support for this effort. Assembly Park’s somewhat barren grounds had been used for public functions ranging from horse races and baseball to religious camp meetings. 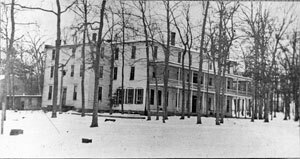 A former resort hotel, “a rambling, rundown building, heated by wood stoves,” was large enough to accommodate a chapel, classrooms, dining room, library, offices, and dormitory rooms. 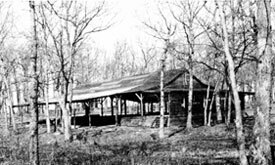 Nearby was the “tabernacle,” a roughly built structure resembling today’s picnic shelters. It could be used for commencement and other group gatherings. In the middle of the first school year, the board sought $18,000 ($216,363 in 2007 dollars) in donations to purchase 103 acres backing up to what is now called the “Hill” and to erect a new school building. Eastern Mennonite’s first classroom space was in a former hotel, used from 1917 until it was razed in 1941. In this period, Eastern Mennonite narrowly missed taking root in another location. In the spring, a few months after the board decided to erect a new building facing Massanutten Mountain, Principal Smith learned that $44,000 (about $500,000 in 2007 dollars) would buy an existing campus, with a good school building, near Martinsburg, Pennsylvania. This was less than it would cost to build in Virginia. “The offer tantalized Smith, who had become discouraged by problems in running the school, especially with what he considered slowness of support by the Virginia brethren,” wrote Pellman. In the fall of 1919, enrollment hit 77. Eager anticipation of the new campus among Mennonites in the mid-Atlantic region probably boosted student recruitment. Tuition revenue was satisfactory for paying missionary-level wages to the faculty and staff but then, as now tuition revenue could not cover the total infrastructure cost of educating Mennonite students. Smith sent his $275,000 fundraising plan to church members everywhere, not just throughout Virginia. 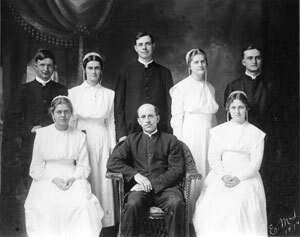 First graduating class in 1919, with President J.B. Smith at center-front. Desperate for new facilities and praying for a generous response from donors, Smith and his board okayed construction on a new central building for EMS before all the funds necessary for both building and relocation were in hand (a leap-of-faith practice until recently at Eastern Mennonite, as will be seen further). Volunteer labor was used as much as possible “several times during the fall and winter, classes were suspended while students helped finish construction and clean the new building” but the school still accumulated a debt of $70,815 ($736,295 in today’s dollars) by the spring of 1920. This would be an astronomical sum now, with our school 40 times as large as it was then, so one can imagine how staggering it felt to the frugal Mennonite farmers and businessmen who backed the school in the era just before the Great Depression.